The Congo (DRC) suffers from a very complex problem of poverty and a long history of human exploitation. There is a tremendous need to advance at all levels, and both men and women need to progress in ways that can contribute from a sincere awareness of their own abilities as well as a balanced self-affirmation. 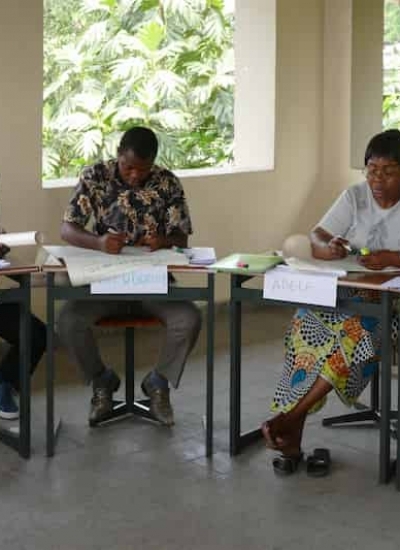 In Kinshasa, two Congolese educators contribute by giving courses and offering complementary individual accompaniment. They work with the effective method of PRH-Personality and Human Relations, where they have received an in depth formation. The material preparation and the promotion of courses demands a lot of work. This is difficult in Congo because of the exorbitant cost of photocopying and the fact that postal services, electricity and internet connection are not guaranteed. In the summer of 2014 they managed to bring together a group of 12 (young) motivated adults who wished to support these activities. Among them are people with ICT skills, educators and women who are in training to become, in turn, PRH educators. This group opens perspectives towards greater personal and relational formation in the Congo. In turn, they also need to follow a training about collaboration and on how to position themselves within the groups.